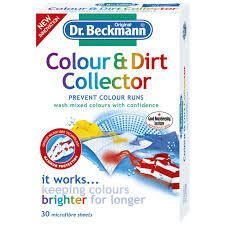 Prevent colour run disasters with the Dr. Beckmann Colour & Dirt Collector Cloth. A re-useable cloth with the ability to collect all the stray dirt and dye that is swimming around with your clothes in every wash. This clever little Colour & Dirt Collector Cloth just needs to sit in your washing machine and every time you wash you know your clothes will be protected from colour runs, making sure your clothes stay brighter for longer. The cloth is perfect for those heavy washers with lots of multi-coloured wash loads, and not forgetting those times when a stray coloured sock sneaks into your white wash.
Dr. Beckmann use a unique fabric that means the Colour & Dirt Collector Cloth can be used in up to 30 wash loads and the handy counter included in every pack will help you keep track of your washes. Click here to watch TV’s Kim Woodburn demonstrate Dr. Beckmann Colour & Dirt Collector. New coloured items can lose excessive amounts of dye during the first few washes. Always check garments care label and machine wash instructions beforehand. Do not overload the washing machine as this can impede the absorbency of the cloth. Cloth can safely be put through a dryer or a tumble dryer. Keep out of the reach of children.